Some of the buildings in the Providence, Rhode Island, area associated with James C. Bucklin are shown below. James C. Bucklin (1801-1880) was a builder and architect with 300 projects to his name in Rhode Island so there are many buildings and sites associated with him. This building is known as the “Cabinet Building”. Designed by James C. Bucklin as the first headquarters building of the Rhode Island Historical Society, it was a truly great space conception. The Cabinet was the first American building specifically designed for a historical society. It was built in the style of a little Greek temple, fifty by thirty feet in size, with good attention paid to the efficient use of space for the purposes of a historical society. 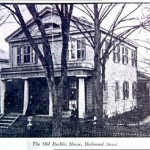 Expanded by the addition of wings in 1891, the Cabinet remained the headquarters of the Rhode Island Historical Society until 1941, when it was be sold to Brown University. Through the years the uses of the building changed. 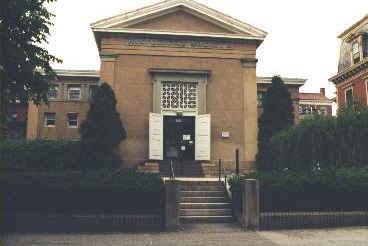 In 2000 AD the Cabinet Building served as the copying center and photo lab of Brown University. In October of 2004, following a major renovation, the building became the home of Brown University’s Population Studies & Training Center. (See: http://www.pstc.brown.edu/space.html for details.) We are indebted to Anne K. Ilacqua, Information Specialist, Brown University, Population Studies & Training Center for the present information. James C. Bucklin a number of the buildings of Brown University, the most visited being Brown University’s Manning Chapel. 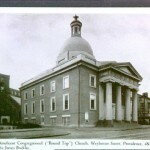 This is the Beneficent Congregational Church on Weybosset Street. Built in 1809 and remodeled in 1836 by James C. Bucklin with a unique round top, hence known locally as the Round Top Church. James was enthusiastic about using columns such as you see on the front of this church, and which you will see if you visit the Bucklin Arcade Building. The Bucklin Arcade was designed in 1828 by James C. Bucklin. Now it is discussed in many architectural history books as being the first indoor shopping mall in the Americas. See the splendid photos and write ups in the May, 1981 issues of the Architectural Record [Robert Alexander, The Arcade in Providence, Journal of the Society of Architectural Historians, Oct, 1953.] When the Arcade was built in 1828, its 22 foot granite columns that still support its entrances were the largest in the country. The Metropolitan Museum of Art has called the Bucklin Arcade one of the finest examples of 19th century commercial architecture in the nation. Both as a building project and as one of the over 300 architectural projects of James Bucklin, it is impressive. The Arcade building was a joint design of Russell Warren (1784-1882) and James C. Bucklin (1801-1880). This design is the first shopping mall in the United States. Light and able to hold a number of businesses, it revolutionized the concept of shopping in the United States. This is a drawing of the Westminster street side of the Arcade building that James C, Bucklin designed with a pediment over the columns (at 21 feet high and 3 feet wide, the largest stone columns in America at the time of erection). This is a drawing of the Weybosset street side of the Arcade building that Russell Warren designed, with a parapet over the columns. 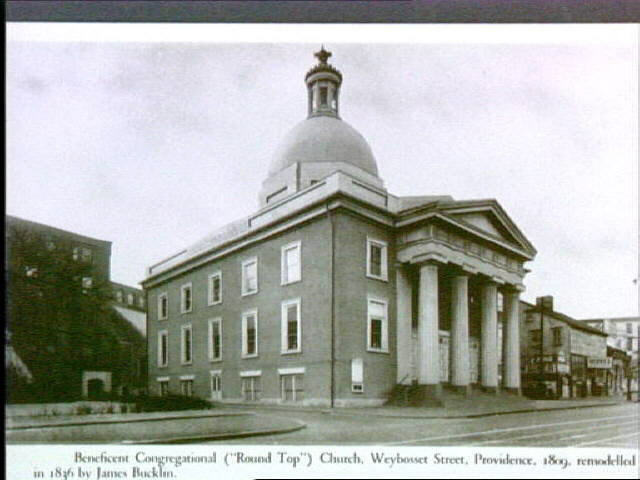 This was the first monumental business building in Providence, erected by Cyrus Butler in 1828. It was revolutionary in a number of items, among which was that it instituted a Greek revival that superseded Colonial traditions. Its walls were built of granite, 216 feet long. At each end is a portico, 15 feet deep. A corridor extends through the building, open to the sky lighted roof, flanked by three stories of shops, those on the upper levels fronting on balconies open to the center corridor. To reach the Bucklin Arcade from I-95, take exit 22, Downtown Providence, and follow signs for downtown. At the stoplight at the end of the ramp, turn right, onto Francis Street. At the next light bear left into Dorrance street. Continue for at least four traffic lights. Turn left onto Weybosset Street. The Arcade is a block down the Weybosset Street. A parking garage is across from the Arcade. 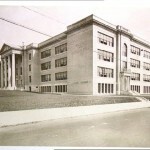 The Bucklin Street Junior High School is not one designed by a Bucklin building, but it was known for years as the Bucklin Street Junior High, in Providence. 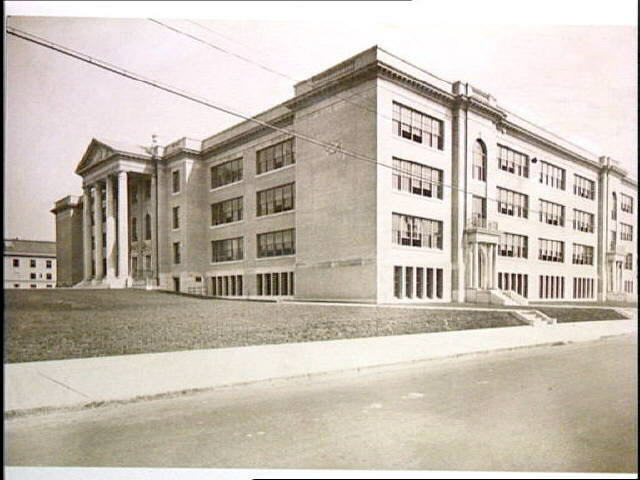 It was on Bucklin Street, (and perhaps still exists) but was formally named the Gilbert Stuart Junior High School. House Richmond StreetWill someone in Providence try to locate this house, if it still exists, and get a street number for us? 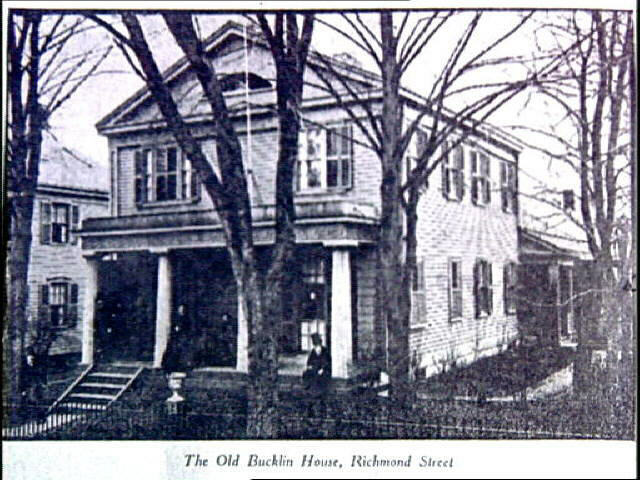 This photo is in the Providence Library, labeled as “The Old Bucklin House, Richmond Street.” The date of the photo is unknown, as well as why it was considered important enough to take a photo of it. Maybe the present owners know who the “Old Bucklin” was?